As you head to work Tuesday morning, you are probably bundling up. Temperatures have dipped into the 30s and 40s across South Florida. You might also want to check your car dashboard because you may see a tire pressure warning light. The cooler weather means your tires can lose about 1 pound per square inch (PSI) for every 10 degrees. But does that mean you have to put air in your tires? "These cold snaps that we get, people aren't used to, and tires aren't used to. Suddenly everyone's got their tire warning light on and they're all coming in thinking they got nails in their tires. And in most cases, it's about adding some air and getting tires back up to shape," said Rick Kearney, a certified Toyota diagnostic technician at Earl Stewart Toyota. Kearney said when it warms back up the pressures do come back up but that still doesn't mean you shouldn't put air in your tires. "Even with low pressures, you should probably put some air in it to keep the pressures up where they are otherwise you'll get some bad wear on the tires," said Kearney. "The easiest way to tell if it's a problem is if all four tires are at about the same pressure, and all four low. If one is lower than the others, it probably has a leak in it." He said most people are driving with their tires lower than they should be. "It's a good idea to check your tire pressures at least once a month," said Kearney. "Or even better, once every week or two, just to make sure those tire pressures are right." Usually your tire pressure light will come on at a certain level, which is around 26 PSI for most cars. "Obviously that's a lot lower than what your tires should be at. Most should be around 32 to 35 PSI, so it's a good idea to check your tire pressure often," said Kearney. If you're planning to travel at all up north this winter -- especially with the snow hitting as far south as South Carolina -- you'll want to prepare your vehicle. 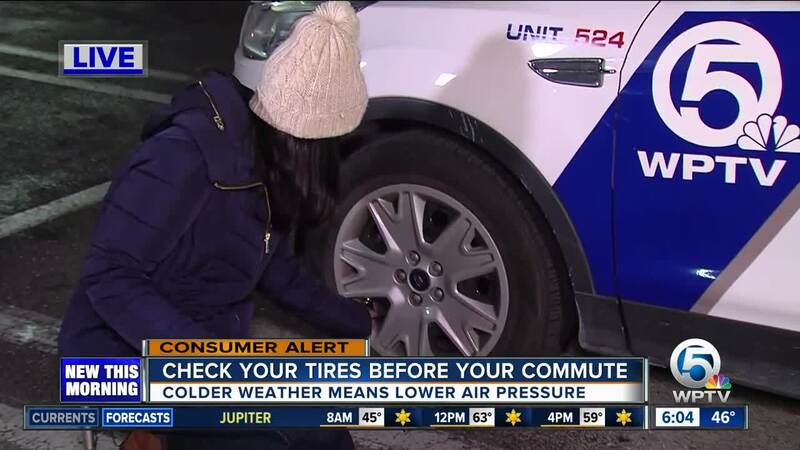 "Bump those tire pressures up by about 2 or 3 PSI and make sure your tires are in good condition and that you have plenty of tread life left on the tires," said Kearney. You can check your tire tread by taking a penny and turning it upside down. Stick it in the tread and if any part of Abraham Lincoln's head is covered, you are good. If not, then that means you might need to get a new tire.